Now that the campaigning is well under way lets take a look at each of the party's websites and how they are using them to acquire voters for the election. So Theresa May has decided to have a “Snap” General Election on the 8th of June in order to decided on how to proceed with the UK leaving the European Union through “Brexit”. Now that the campaigning is well under way lets take a look at each of the party’s websites and how they are using them to acquire voters for the election. For the the investigation to be fair, I will search for each of the party’s websites via google, omit the ads and go straight for the selected party and lets just take a look at the home page rather than all pages on each site. Let’s start with the current government, the Conservative Party. OK, so first off, you land on a “Splash page” asking to sign up to a mailing list or make a donation. 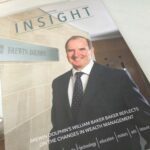 It is also very difficult to find your way to the home page if your don’t want to sign up to their newsletter or make a donation. When you eventually land on the home page, your eyes are drawn to the statement from Prime Minister Theresa May about a “Brexit Deal”, the manifesto is available on the home page as well as the standard donate, join and volunteer links. It also has a search menu to find a local team, however, the worrying thing is that on the home page has a slur on an opposing party leader. All in all the website’s design is lacking in anything interesting, it is restricted to a very tight area in the centre of the page. Everything else is balanced, clear to read and laid out with easy understanding, it is just outdated. Again this webiste begins with a splash page, however, you can actually skip to the home page easily via a large butoon on the sign up form. Once on the home page, the first thing you see is a video about Labour’s policies from a well known actress from ITV drama Broadchuch and options to share this video on social media beneath it. Just like the Conservatives website, the website it has the standard donation, sign up and find your local team links, as well as their Manifesto. 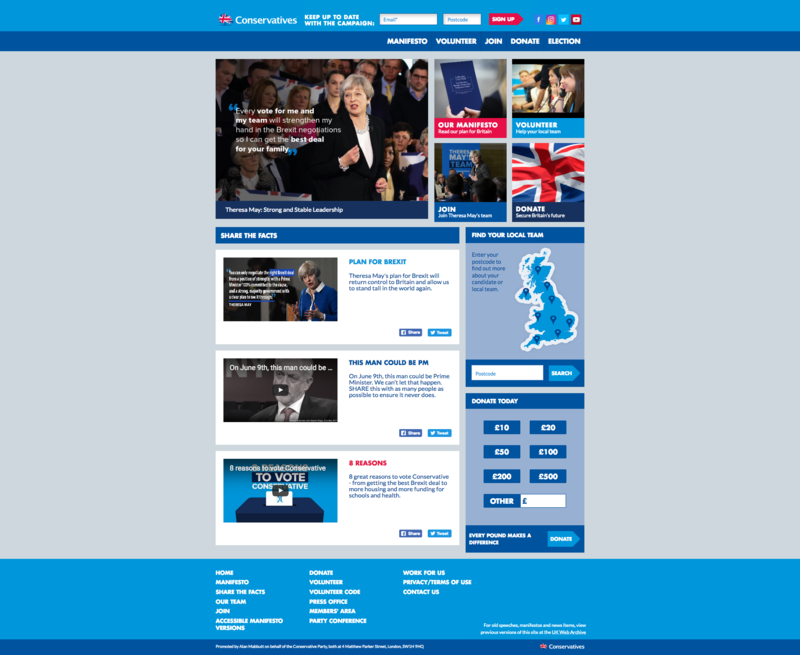 My first opinion about this is that the website is far more contemporary than the Conservatives, it is less stark and far more inviting. 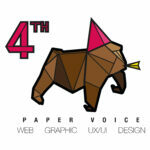 The overall look of the site is good, it also functions well and reflects the party correctly. 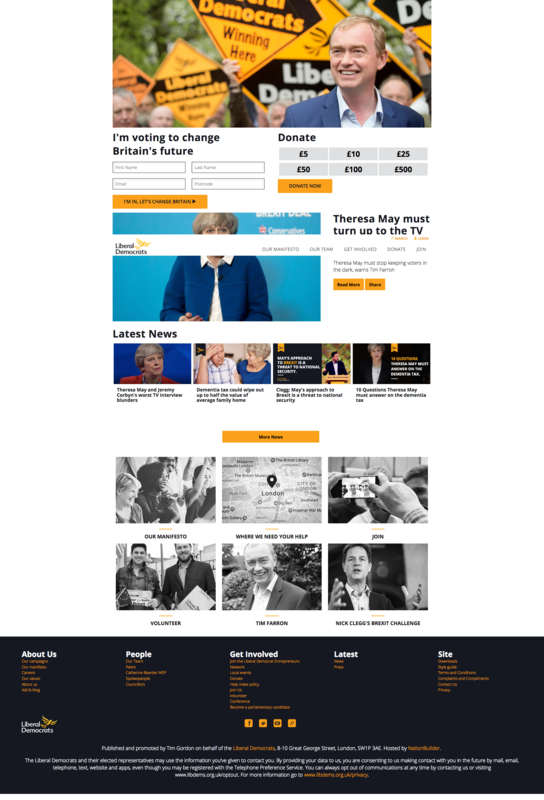 No spash page on this one, thankfully, the page opens with a banner of party leader Tim Farron, directly beneath are donate buttons and a sign up form …as standard. Following this are news stories, the upsetting thing here is that the majority of the stories are slurs on other parties rather than good stories about the Lib Dems. 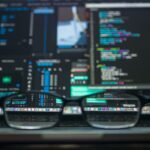 Their maniesto is also available on the home page and volunteer information, the footer is well stocked with important links and information which is set at full width …why the rest of the site is not, is a bit of a puzzler. The design of the site is lack luster, something you would have been impressed with in 2011 and earlier, why they have restricted the content to so such a small area makes no sense. The footer is the best thing about the home page, the rest of the page is a little disappointing. OK…. where do I start here, this website is not even responsive… not a good start. So sign up, manifesto, join and donate buttons all as standard, beneath that are nonstop attacks on other parties. This website is not good, it’s doesn’t really instigate hope. You can’t even view this website on you phone without a struggle, this does not reflect well for a politcial party invested in the future of the UK, this is the worst of the group. This is good, the Greens have strong branding throughout, it is well designed has all of the standard donate, join and sign up links, the issue for me was, I couldn’t find their manifesto. 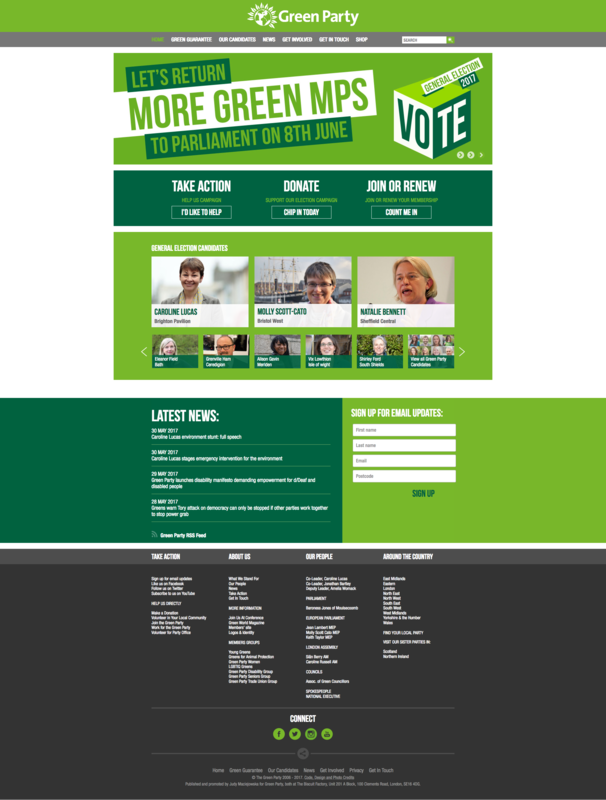 This is obviously very important for all other political parties however, it is not on the home page of the Green party for some unknown reason. This is disappointed, considering how well designed the website functions well and the branding is really good. 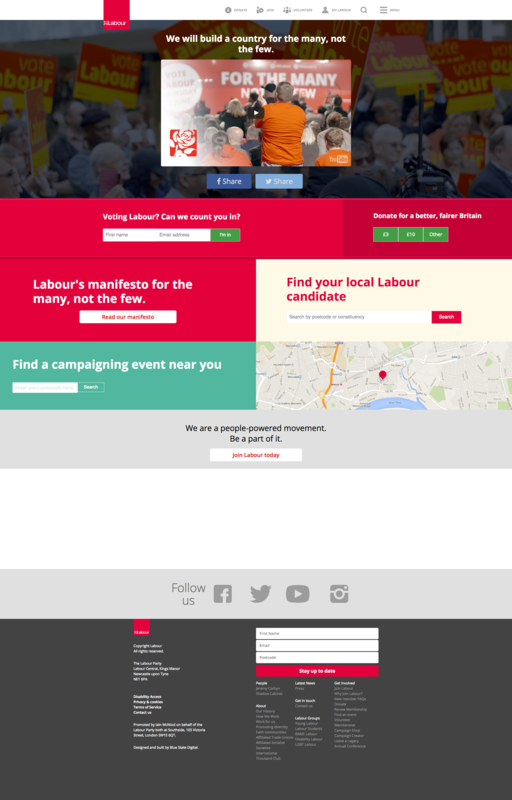 So out of all of these, I can say that the Labour website is the overall most well designed site out of all the parties.